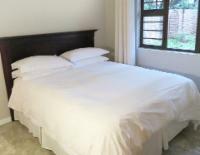 Modern spacious air conditioned double room with queen sized bed. Full en-suite bathroom with underfloor heating, fridge, microwave, DSTV, private patio. If cancelling 2 days before arrival, forfeit 50% of the booking total. If cancelling 14 days before arrival, forfeit 25% of the booking total. If cancelling 21 days before arrival, forfeit 12.5% of the booking total. Long stay / Monthly rates available Children over 12 may stay in the suite on sleeper couch for an extra R150.00 per night. We regret no pets allowed.